Thanks to everyone who entered our competition. We had some great designs and will announce the winners soon. The Darlington Cycling Campaign is holding its Annual General Meeting this Friday, 18 February at Darlington Media Workshop, (behind the Arts Centre, Vane Terrace). The meeting will provide an overview of what has been achieved for cyclists in Darlington throughout 2010 and will include an illustrated talk featuring current examples of Darlington’s cycling infrastructure demonstrating what has and has not been achieved. This will be followed by a question and answer session. “With savage cuts looming for all public sector organizations, it is more important than ever that people take every opportunity to voice their concerns and draw attention to the issues that impact upon their daily lives. More and more people are considering using their bicycle for that short trip to the shops or to get to work. The question is does our current and planned future provision for the everyday cyclist meet that need? This is where the work of the Darlington Cycling Campaign is focused, to raise the concerns of local cyclists with the decision makers”. The message then, is simple – if you love riding your bike, ride a bike for the convenience it offers, or would like to ride your bike more often, but have concerns about doing so, then come along this Friday and share your thoughts with some fellow cyclists. We look forward to meeting you. The event is being held at Darlington Arts Centre on Friday 18th February, starting from 7.30pm in the Media Workshop, Entry is free and open to all. One of the main arguments made by UK politicians, and indeed many cycling campaigners, is that people can be “persuaded” to cycle more once they realise its health and environmental benefits. Accepting UK road infrastructure as “immutable fact”, they believe that people can be “nudged” in the direction of cycling through little changes in behaviour. So how open to ideas about environmental benefit are non-cyclists? Well, a good place to start, given the tiny levels of regular cycling in the UK, is with motorists. A new study by car comparison site car buzz asked new car buyers what they looked for first in a new car. The result is summarised in the graphic above. Most were, not surprisingly, most interested in price, seating space, and running costs. Only 1% considered CO2 emissions important, and of these two-thirds did so to save money. Only one in ten expressed concern about the environment, ie just 0.1% of all surveyed. 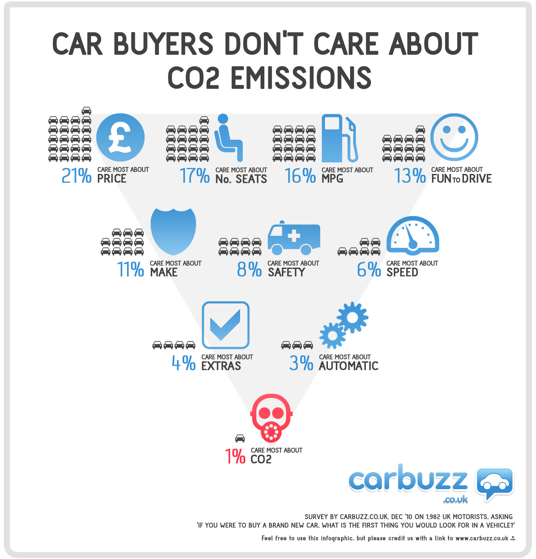 This echoes an earlier survey conducted by the Environmental Transport Association in 2008, which found that 65 per cent of drivers “didn’t have a clue” how much CO2 they produce when driving. The survey also found that men are less worried than their female counterparts about the effect their driving has, with younger drivers being more environmentally aware. But most UK cyclists are also car drivers. Might there be some sort of conversion to environmentalism once we mount the saddle? 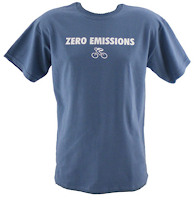 Although there is no definitive equivalent survey for cyclists available – most cycling-related attitudinal surveys seem to be asking non-cyclists “what would make you cycle?” – anecdotal evidence such as the proliferation of T shirts like this one would suggest that at least some cyclists rank environmental reasons as important. On the other hand, the few times cyclists are asked to say why they cycle, they come up with all kinds of other – often philosophical and contemplative – reasons. Helping the environment, it seems, is all a bit too altruistic for most people. It is clearly a waste of time hammering on about moral reasons to get people cycling more. At the end of the day, cycling needs to be more convenient, cheaper, quicker and more pleasant than driving. Good quality infrastructure delivers this. But as long as our politicians gaze upon our urban roads without any awareness of how backward our urban environment has become, they will continue to declare that a UK cycling experience of necessity involves rubber knickers. 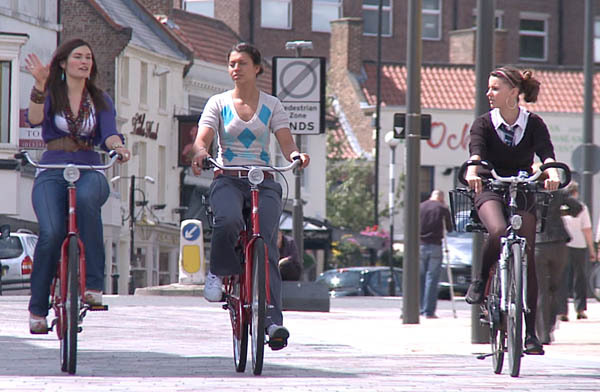 Today, the Borough Council’s Economy and Environment Scrutiny Committee receives a report about cycling in the town centre during 2010. As most people will recall, when the centre of Darlington was pedestrianised, there was considerable resistance from a number of quarters to the idea that cycling could be part of the new arrangements. But following a number of studies, including our own, that showed that town centre cycling posed little danger to anyone, the council backed cyclists. At the same time, and to calm the fears of others, it agreed to set up a monitoring programme and regularly review the decision. Today that review takes place. During this period, there have been three collisions between pedestrians and cars (two taxis and a private car) in the Pedestrian Heart. The private car failed to stop. The manner of the reporting suggests that the pedestrians were at least partly to blame. All injuries were described as slight. The only cyclist/car accident reported was not strictly within the Pedestrian Heart. A car decided to do a U-turn at the Stonebridge/Tubwell Row/Crown St mini-rdbt. A cyclist attempted to avoid a collision, contact was minor, but as a result he collided with a kerb and then a wall. This was rated as a serious injury. There is no comment as to prosecution or outcome of injury. A representative from the Campaign will be at the committee meeting today to argue that the monitoring process should now be terminated.